Often we have heard we are a soul with a body, and not body with a soul. What makes us is our soul which is our spirit. We are defined by the purity of our soul and not by our external appearances, and this holds true for all living things on this planet! Hence when we love someone, it’s not because they are beautiful externally but because they have a beautiful heart, and here heart simply refers to our soul! c) Spiritual Body – Emotions, Life lessons, traits, perspective etc. It’s the energetic and the spiritual body that makes up our SOUL. When our soul connects with our body for the first time to begin the state of rebirth, it is in its purest form. At the early stages (up to 3 months) the links are quite weak, but as the fetus starts to develop, more aspects are able to unite with the physical body and the process continues even after the birth. Our souls have the capability of creating aspects of it to hold on to painful memories and unhealthy patterns. When the memories or patterns become too painful it is moved from the conscious to the subconscious level. Our Higher Self is aware about all the movements, but it does not intervene until and unless we consciously ask it to do so! What is a Soul Fragment? When we undergo a huge trauma or loss, a part of our soul or a tiny fragment of our soul leaves us so that we do not get also that fragment of our soul remains unscathed. If we live in a house for a while or if we are in a relation for a long time, there are high chances we leave our soul fragments at that place or with another person! Hence we say, a part of my soul dies, or my heart still beats for him/her! It’s nothing but the absence of one’s soul fragment! Soul fragments are not only for a particular life time it can be across space, life and dimensions! Why call back one’s Soul Fragments? How to call back one’s soul fragments? Sit where no one will disturb you over a minimum of 10-15 minutes. Activate all the symbols on your palms or chakras; also draw the symbols on your Solar Plexus, Heart, Throat, Third Eye, Crown and back of your neck. Visualize a huge purple Chi/Energy ball in front of you which is around 15 inches in diameter. This ball is to purify the soul fragments which we release and also to purify the soul fragments which we are calling back. State the intention “I release everyone’s soul fragment across space, life and dimension which I have been holding on to knowingly or unknowingly, consciously or unconsciously and go back to where they originally belong to”. State this intention or something similar you resonate with thrice and keep healing to this intention. Visualise all the fragments from your body/aura is coming out and are getting purified in the purple energy ball in front of you. Keep healing this intention and visualize it that they are going to where they belonged originally. Once you are done with this step, take a deep breath, relax and drink another glass of water. Now State the intention “I call back all my soul fragments across space, life and dimension which others have been holding on to knowingly or unknowingly, consciously or unconsciously” thrice, and visualize all your soul fragments enter the purple energy ball in front of you and be purified. Once the soul fragments get purified visualize it entering your body. You may feel a little heavy but that’s perfectly normal. Once you are done with the process, say your gratitude to the energies and seal it with a reverse Cho Ku Rei. This method has helped me and many of my clients to improve their life in various way! Do try this method and let me know how you felt about it! Thank you for this wonderful technique. I’m a Reiki level II practitioner. I lost my son few months ago and I feel exactly what you describe (a big hole in my heart, that I’m not the same person, that nothing is the same, nothing makes sense now, …). After practiced it I felt very tired with a big pressure in my solar plexus (the same I felt the first two months after my son’s passing), so I gave Reiki to myself and I felt much better. I’m wondering how many times do I need to use this technique and how frequently. Thank you, thank you, thank you. 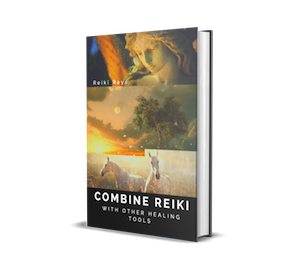 Previous post: Is Reiki Trying to Talk with You?